For this list, two display modes are available. The detailed list mode is suggested by default. It includes covers, titles, years, authors, rating, and some other details (if available). In the latter mode, just covers and titles are shown. The "Cover dimensions" field specifies the target width and height. "Cover cell dimensions" is for the space that contains the "cover + title" pair. Obviously, it always has to be somewhat bigger than cover dimensions, otherwise there will be no space for titles. "Cut covers to fit the given dimensions". 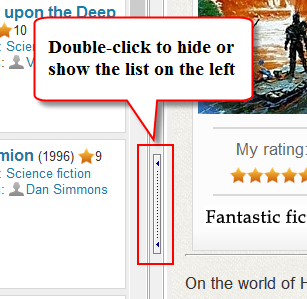 If enabled, this option makes sure that the original aspect ratio is kept for each cover. For example, imagine that after resizing to your specified dimensions you get a 90*150 cover. Booknizer will cut 5 pixels at the top and 5 pixels at the bottom to create a 90*140 cover. 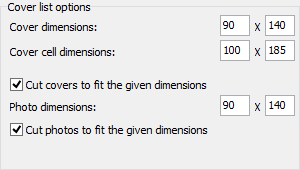 With this option disabled, covers will be resized to the specified dimensions regardless of their aspect ratio. 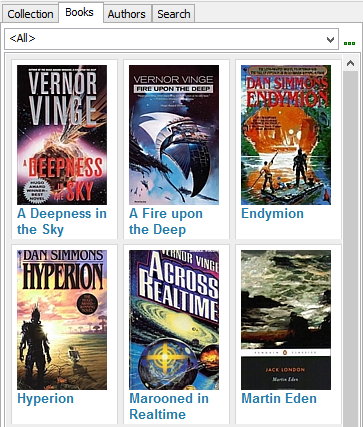 Size of book covers in the detailed list mode can also be adjusted. Find the "Cover / photo width in the list" field in the interface settings window (highlighted on the screenshot). In this mode, you cannot specify height. All covers will be resized proprtionally, so height of different covers may be different in this mode (depending on their aspect ratio). 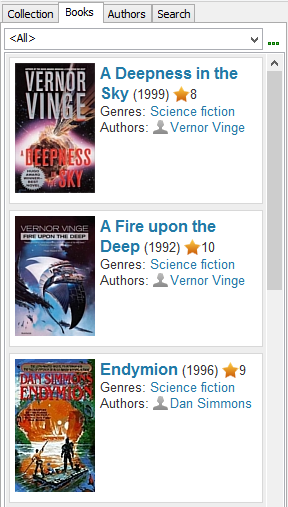 Show covers in the list of books. 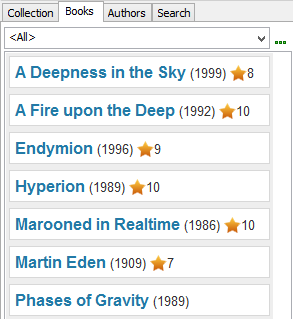 Show only titles and years in the book list. The options above also apply to the list of authors.